ANNAPOLIS, MD – Today, Maryland Delegate Dereck Davis (D-25) brought the Maryland Clean Energy Jobs Act (SB 516) one key step closer to passage. The Maryland House Economic Matters Committee, chaired by Delegate Davis, passed the bill in a 15-6 vote. Now, it will be considered by the House floor. The bill is co-sponsored by 72 members of the House of Delegates, and 84 delegates have endorsed it in total. “We express thanks to Delegate Davis for moving the Clean Energy Jobs Act forward, and to all the members of the House Economic Matters Committee who voted in favor today. The global warming crisis is here, and the Clean Energy Jobs is our answer. Thank you for leading your committee to a historic vote that creates jobs, fights climate change, and makes a difference. We also express thanks to Senator Brian Feldman, who championed this bill tirelessly in the State Senate. The Clean Energy Jobs Act (CEJA) would increase the state’s renewable electricity standard to 50% by 2030 and require legislators to develop a plan to reach 100% clean power by 2040. The proposed bill would create thousands of jobs and make the state a national leader in the renewable energy field, while cutting carbon emissions equivalent to taking 1.7 million cars off the road each year. The Senate sponsor and longtime champion of the bill is Brian Feldman (D-15). Today’s vote follows the bill’s overwhelming bipartisan passage in the State Senate. On March 20, the Senate voted 33-13 to approve the bill. The Clean Energy Jobs Act is the most broadly supported state climate bill in Maryland’s legislative history. More than 640 community, labor, faith, business, climate, and environmental groups from across Maryland have already endorsed this proposal. In the 2018 midterm elections, hundreds of candidates for the state legislature made supporting CEJA a campaign issue. After the elections, a de facto “supermajority” of legislators in both the Maryland Senate and House were on record supporting the proposed bill. 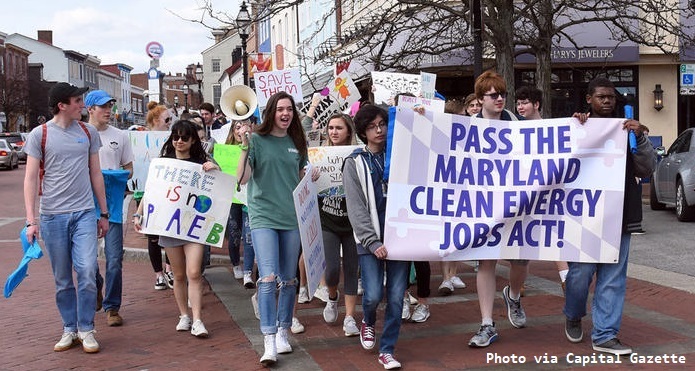 On March 15, hundreds of students walked out of school and descended on Annapolis to call for climate action. As part of the “Schools Strike for Climate,” the students called on the General Assembly to pass the Clean Energy Jobs Act and protect their climate future. A recent statewide poll found overwhelming support urging Governor Larry Hogan to support the Clean Energy Jobs Act. The poll, conducted by well-known pollster Patrick Gonzales, found that solid 64% majority of Maryland voters think that Hogan should support the Maryland Clean Energy Jobs Act, with consistent support spread across all regions. Meanwhile, nationwide concern for climate change is at its peak after recent scientific studies and scandalous climate policy retreats by the Trump Administration. A bombshell United Nations scientific report released in October found that the world has just over ten years to cut greenhouse gas emissions in half. In February, responding to the UN report, ten of Maryland’s leading climate scientists sent a letter to the General Assembly to urgently endorse passage of the Clean Energy Jobs Act this year. “As one of the most affluent and best-educated states in the most powerful nation on Earth, Maryland has an obligation to lead,” they said. A recent analysis from the Maryland D.C. Delaware Virginia Solar Energy Industries Association (MDV-SEIA) found that Maryland could lose out on approximately $247 million in federal tax credits between 2019 and 2022 if the passage of the proposed Clean Energy Jobs Act is delayed by one year. In 2018, thanks to Trump and other factors, Maryland lost over 800 solar jobs. Even more jobs could be lost this year if the Clean Energy Jobs Act is not passed. The CCAN Action Fund is the advocacy arm of the Chesapeake Climate Action Network, the oldest and largest grassroots organization dedicated exclusively to raising awareness about the impacts and solutions associated with global warming in the Chesapeake Bay region.